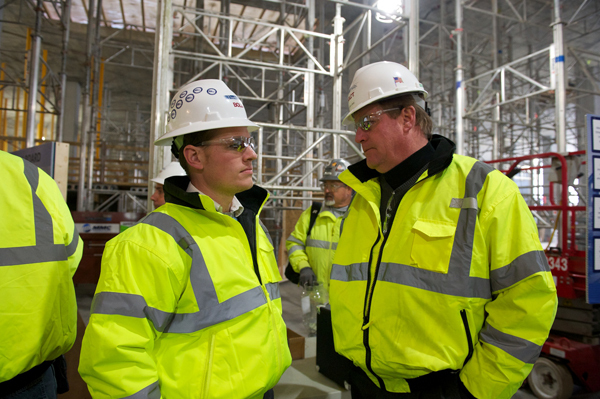 (L-R) Becks discusses a safety concern with project executive Patrick Oaks after their weekly safety meeting. Paul Becks admits he’s a demanding person. As Welty-Boldt’s field manager on Akron Children’s Hospital’s $200 million “Building on the Promise” expansion campaign, it’s a vital personality trait that helps him lead hundreds of crew members to keep the project on time and on budget. Becks talks about progress in regards to the schedule with HVAC foreman Chris Fowler and his teammate. Becks facilitates the process of planning each task on a rough basis about 6 weeks out. Then, as that specific task approaches, he’s busy getting all the details and components in place and finally, he rallies his crews to implement it. He and his team set up the workers for success, thinking through all the potential pitfalls prior to implementation. If any issues do creep up, he works hard to resolve them quickly and efficiently so there’s minimal disruption on the job site. 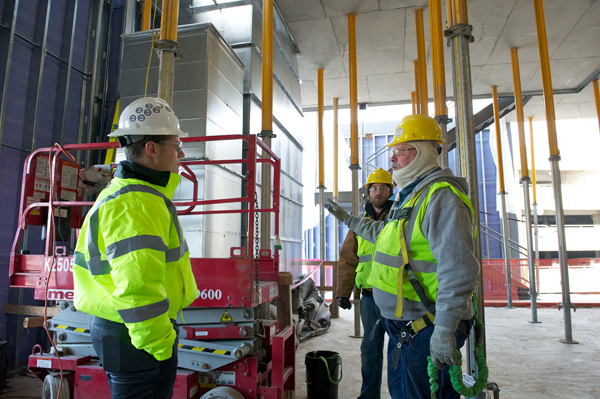 Paul Becks (on left) discusses the HVAC vertical risers with the installation team. To keep his team informed, Becks holds daily huddles with all the trade partner project managers. They discuss issues or concerns on the job and make every effort to resolve them right then and there. Field manager Paul Becks (on right) discusses logistics for the pedestrian bridge installation with iron worker foreman Louie Cataldo. 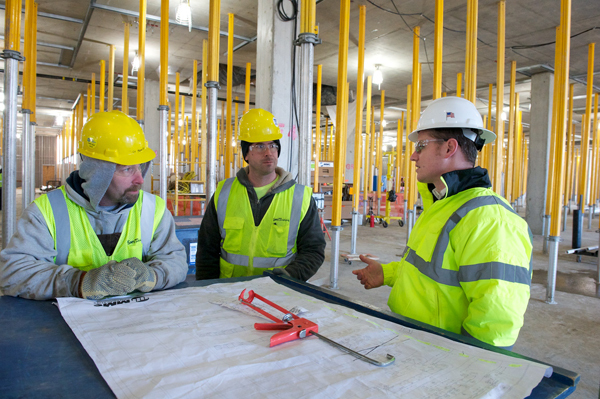 In addition, he hosts “Lunch and Lean” meetings on Wednesdays with the construction team, where they watch educational videos or hold discussions on ways to work more collaboratively and efficiently. Becks also gets together with his construction crews for impromptu lunches and happy hours to keep the morale high. Becks got his start in construction early on. His father also worked in the industry, but he discouraged his son from following in his footsteps due to the job’s demanding nature. But while attending Ohio State University as an aerospace engineer, Becks realized construction was where he belonged. He wanted to build things. 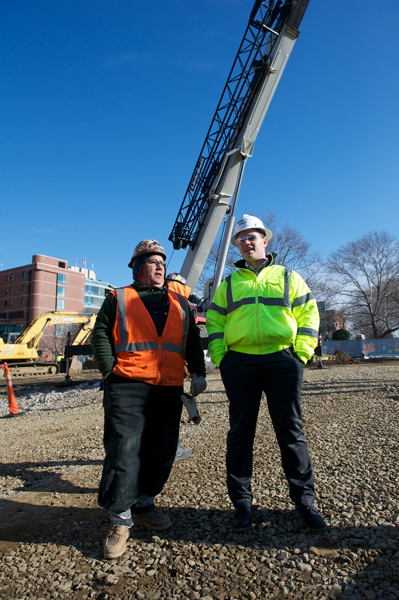 He wanted to be out in the field amidst the action, so he switched his major to civil engineering and has never looked back. Since then, he has helped transform the region by working on major construction projects, including the Cleveland Clinic’s Intercontinental Hotel, Akron YMCA and Goodyear Tire & Rubber Co. headquarters.